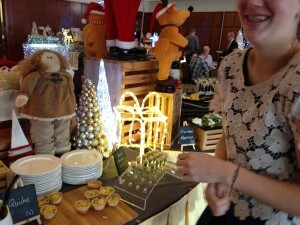 The Stormont Hotel had Santa Sunday Buffets throughout December, we attended the last one and it was almost booked out so get your booking in quick for next year! 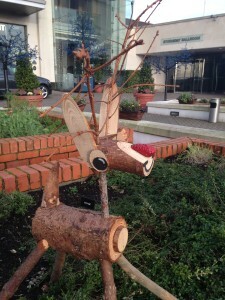 On arrival to the Stormont Hotel the kids were ‘tickled pink’ with the little wooden reindeer set up in the grounds. As per usual, dad had to take a photo and we listened to his usual ‘ I could make one of those’!! This little fellow was so cute and very well make, he was an excellent addition to the lights and beautiful Christmas trees at the front door. The entrance was majestic, for want of another word. 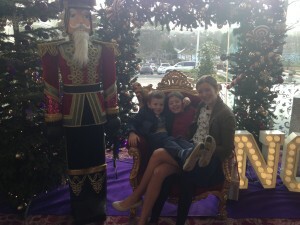 A wonderful luxurious chair was placed beside a fabulous Christmas tree and the most beautiful and largest Nutcracker I have ever seen. It was a photo opportunity for certain. After the kids posed for the camera we entered the ballroom for our dinner. 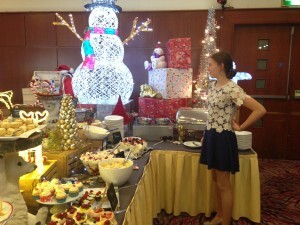 The previous Santa Sunday Buffet we attended in another hotel was set up somewhat different. We went to see Santa in the traditional way after our food. 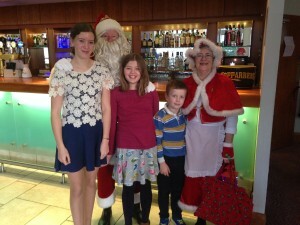 However, at The Stormont Hotel, Santa wanted to make sure the kids were being good throughout the meal, not just at the end for a short visit which any kid could have ‘faked’ – no, Santa was thorough. He had Mrs Clause in tow and they kept a close eye on everyone to see who would be appearing on the naughty or the nice list this Christmas. 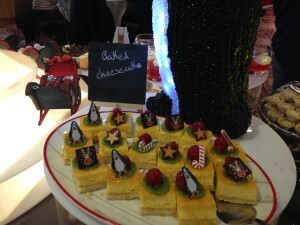 The food was wonderful – very elaborately displayed with every detail attended to. The starters seamed to go on forever. 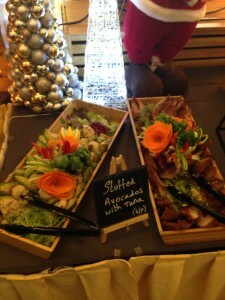 We could select from stuffed avocado, poached egg in ham, pate in little mini cups, asparagus and goats cheese etc, etc – it was a fabulous spread. My daughter loved the cute salmon ‘cones’ and mini quiches. 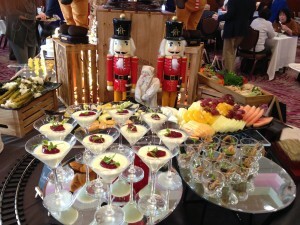 Every dish was garnished with vegetables and fruits which had been shapes into various Christmas themes – the preparation must have taken ‘forever’! 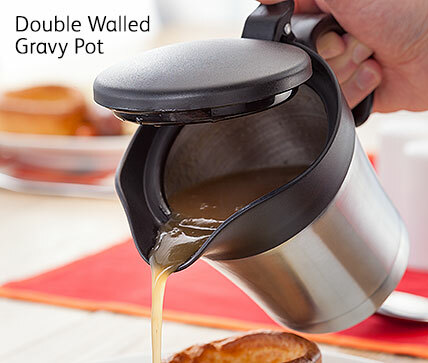 Hubby opted for the soup along with my other children and shortly after we had our main course. 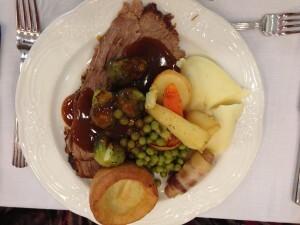 There was a choice of Ham, Turkey, Beef, or Lamb. If you couldn’t decide, you could have a little of each – the staff were more than helpful with ingredients and other questions. They knew exactly what each dish consisted of and were attentive yet not overpowering and very mannerly. Dinner was thoroughly enjoyed by all the kids while they waited in anticipation for Santa to visit our table. 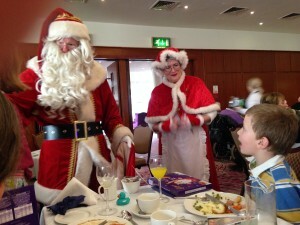 They didn’t have long to wait and my son and daughter eagerly told Mr and Mrs Clause what they wished for this year! 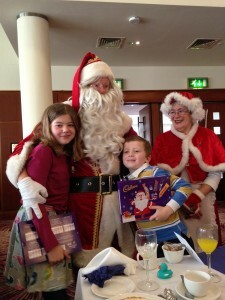 They were then presented with a Cadbury selection box and he didn’t leave out my older daughter either – to her delight! 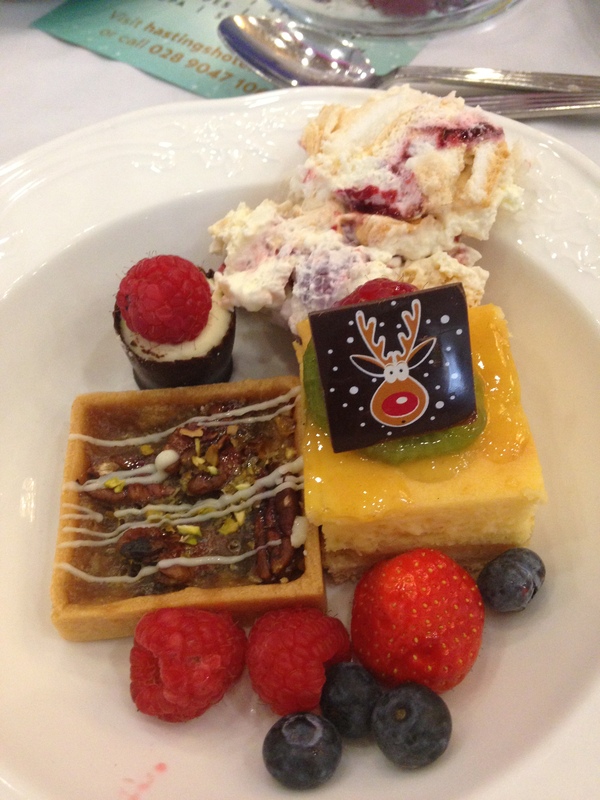 I am not quite sure where to start when it comes to the desserts – I don’t think it would have been possible to count the different number of puddings on offer – all individually labelled with tiny blackboards so the diners knew what was what. 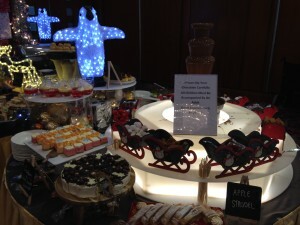 The chocolate fountain was the highlight for the younger kids. 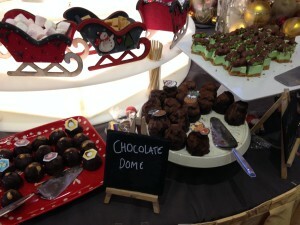 This was arranged in the centre of the display with a number of Santa sleighs around it which contained the various sweets to dip into the flowing chocolate – fudge, strawberries, marshmallows etc. The portions were perfectly sized so it was acceptable to have a few different selections without filling your plate! 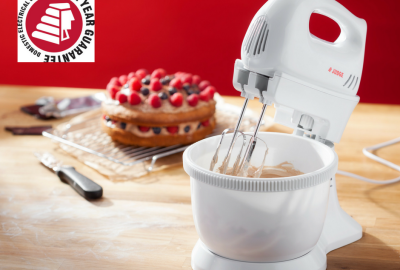 I am a fan of baked cheesecake and its the one and only dessert I make each Christmas. This was delicious and beautifully decorated with Christmas themed chocolate shapes. Cait is the girl in the family with a sweet tooth. 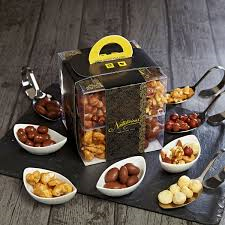 I was so proud of her – she walked around slowly before carefully selecting three mini desserts and then she sat and savoured every mouthful. 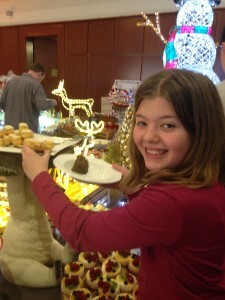 She did revisit the dessert table as she simply couldn’t leave without a skewer from the chocolate fountain as did all of us! On the way out we thanked the staff for the meal and had another photo opportunity with Mr and Mrs Clause. I was so delighted when he came over to me when we were leaving, took me by the arm and told me what wonderful mannered children I had and I should be proud – could you receive a higher compliment from a greater man than Santa himself? – I am expecting very full stockings this Christmas Eve after that!